The BEST cookie decorating recipes ever! Cut-out sugar cookies that don’t spread and perfect royal icing every time. For veterans of my blog and books, you already know this recipe, so forgive the repetition of these cookie decorating recipes. But it’s buried on my recipe page, and I feel it deserves a bit of spotlight. My favoritest ever, most super duper cut-out cookie recipe made it into both of my cookbooks (Sugarlicious) because I’ll never use another. Don’t ever ask me to change it. Not only does it taste so good that I’ve seen people at parties hide these cookies in their pockets before the stash disappeared (really, their pockets), but it holds the cookie cutter shape flawlessly and bakes beautifully. It’s thick with an interesting texture, not too crunchy, not too soft. No spreading, no burned bottoms, no poofs or bubbles. It’s freezable, roll-able, bake-able. Paired with my favoritest ever, most super duper royal icing recipe, you get decorated cookie perfection. Am I being a tad overdramatic about my cookie recipe? Nope. Not one bit. Want to see the recipes in action? .Check out my whole collection of decorated cookies from this blog HERE. Briefly sift together the flour and salt in a bowl and set aside. In the bowl of a standing mixer with the flat beater, or in a large bowl with a handheld mixer, blend the butter and sugar together on medium speed until fluffy. Add the egg and blend well. Mix in the vanilla extract and optional flavored extract, if using. Gradually blend in the flour mixture on low speed. Cover the dough (I scrape mine out of the bowl and put in a gallon-size Ziploc bag) and chill dough for about two hours. When chilled, work with about one-third of the batch at a time. Briefly knead the dough and roll it out 1/4-inch thick, or 3/8 inch if inserting sticks for cookie pops (see below for cookie pops how-tos) on a floured surface. Cut out your cookies and place one-inch apart on a good quality baking tray lined with a piece of parchment paper. Bake in an oven preheated to 375 degrees for 12 to 14 minutes. Thicker or large cookies may need up to 20 minutes. Cookies are done when the edges are golden brown. Yields: 25 to 30 cookies (2 to 4-inches), 65 to 70 mini cookies (1 to 2-inches) or about a dozen large cookies (6-inch). notes: You can make this dough the night before you bake with it. Just take it out of the fridge and let sit at room temperature until it’s still chilled, but pliable. You can also freeze this dough. After mixing, put the dough in a gallon size Freezer ziploc bag (or wrap well) and freeze. Thaw overnight or for at least a few hours in the refrigerator in the ziploc bag. If the dough is too chilled to handle, let it sit at room temperature for about 1/2 hour to 1 hour until it’s workable. Chilled is good, though, don’t let it get too mushy. For the royal icing recipe, click HERE. 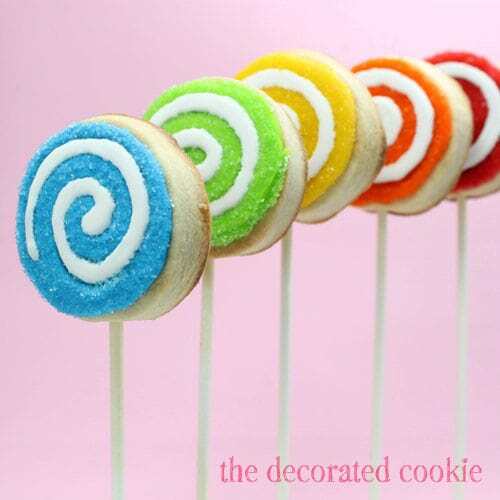 For how-tos on making cookie pops, click HERE. 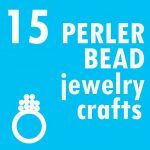 For tips on supplies and where to find them, click HERE. For food coloring information, click HERE. 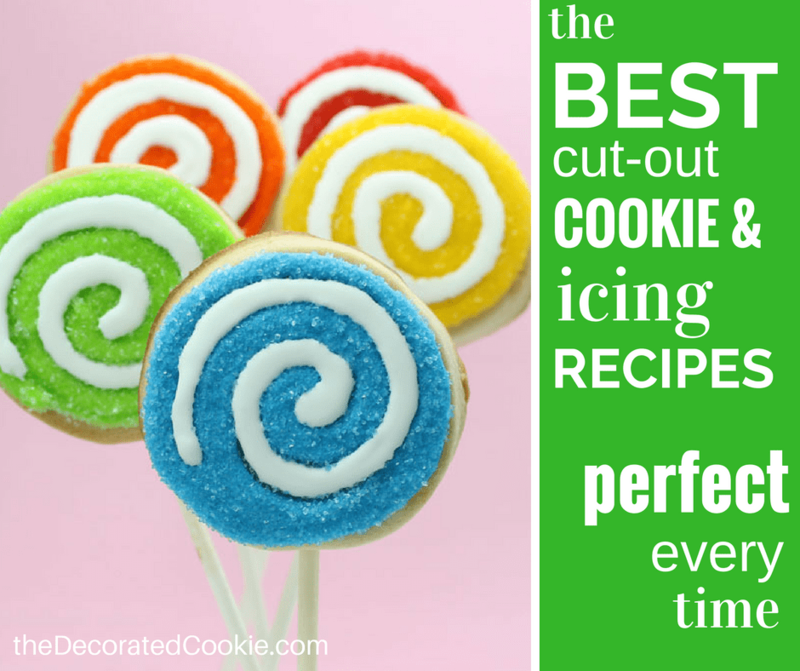 For tips on building a cookie cutter collection, click HERE. 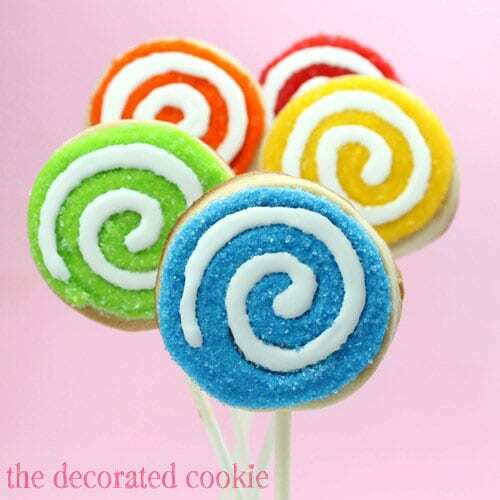 To decorate these cookies… I originally made these swirly, sparkly cookie pops way back almost three years ago, HERE. You’ll find the link to the decorated instructions in that post. Using sprinkles makes cookie decorating so very easy, because sprinkles have the magic power of covering any mistakes. To decorate, divide your royal icing and tint your preferred colors, including white, using Americolor Soft Gel Pastes (Red Red, Orange, Egg Yellow, Electric Green and Sky Blue used here). Then, prepare decorating bags with couplers and size “5” tips, fill with icing, and close tightly with rubber bands. 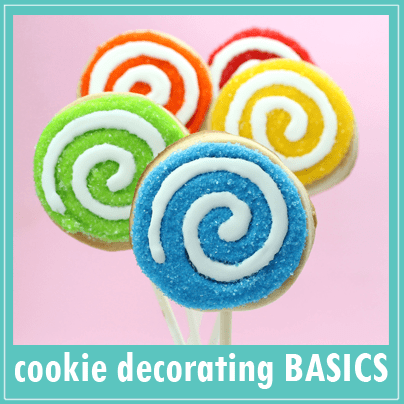 Pipe a swirl on a cookie with one of the icing colors, and immediately coat with a coordinating color of sprinkles. Turn over to remove excess, then pipe a swirl of white on the cookie. Let the cookies dry overnight before handling or packaging. UPDATE: Conversions for the rest of the known world!!!! Because I’ve had some requests from those masses that live outside the US (wherein we stubbornly reject the switch to metric), I’m including some UNofficial conversions. I came up with this list ages ago based on what is printed on the ingredients’ packaging and some internet research. These have NOT been tested by me, but as soon as I finally get a kitchen scale, I’ll make sure they are accurate. Thus, if something feels off to you, go with your instinct (and feel free to let me know). Can’t wait to try them! I never make cut-outs because all the recipes I’ve tried just leave me with a bunch of disappointing cookies that sorta-kinda look how they’re supposed to. I need this – thank you for highlighting it. There will always be a new audience so don’t hesitate to revisit oldies but goodies! But can you help those from foriegn climes – what is the measurement you call a “stick” of butter? Can you express it in a weight or volume, please? Thanks. Oooh, good point. Also, on my to-do list, get a kitchen scale (as I roll my eyes at the US resistance to go metric.) I have these UNtested UNofficial conversions buried on my blog. But these are based on internet research and reading the packages, not tested with an actual scale!! have you (or anyone else) ever tried (or adapted) this recipe in high altitude? I haven’t Sarah… low land baking for me. Anyone else out there who has, please feel free to weigh in! Thanks for sharing and reminding me of this recipe! It’s always good to go back to the basics. Tasty cookies are tasty. 🙂 I looked at the icing recipe and have a couple questions though: What is meringue powder? I’ve never heard of this – I thought merring was egg white and sugar. What is crisco? One question unrelated to the current post – how do you make buttercream white? I’ve been trying to make mine coloured using pastes and gels, but because of the base ‘yellow’ colour, it’s not accepting them very well. Pinks are coming out muddy and reds go orange. I tried to make some purple and ended up with a muddy and unappetising purple colour. Maybe if I can get it white first, it’ll go the colour I want? I used this recipe for graduation cookies and put them in push pop containers. They were fabulous and the frosting was perfect! By far the best recipe I have ever used. I agree, these cookies are the best. Your recipe has completely wiped out my mom’s sugar cookie cut out recipe, but don’t tell her! High praise to beat out mom!! Aw, thanks, Kathy!! 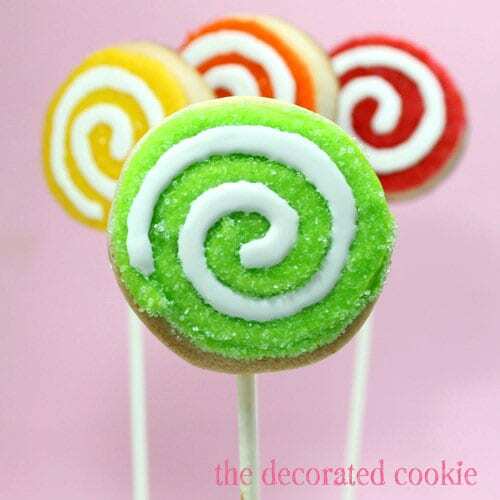 How cute are those swirl cookies pops!?!? I bet kids flip for them! These are similar to my favorite sugar cookie. The confectioner’s sugar gives them a velvety melt in your mouth texture and trust me you want to add the almond extract. I’m lazy so I push mine out of a cookie press and bake them like spritz. Delish! The original recipe I use was cut from a newspaper over 40 years ago and later appeared in Betty Crocker cookbooks. Exactly Ann! I’ve seen similar, too. The original recipe I doctored up just a bit from one my mom had handwritten in a recipe book I found in our cupboard. And that would have been from when I was a kid (so over 30 years ago), and now that you mention it, it would make sense if she got it from a Betty Crocker cookbook. Sheesh, I’d love a job tracing recipes through history. These cookies are classic YOU, Meaghan:) Love them! I’ve been on the lookout for a good new sugar recipe! Is this 1tsp vanilla and 1 1/2tsp almond extract added together or is this to pick one or the other? Hi Jenni! Added together. Though the almond is optional. I often just use vanilla, but you can add additional flavoring along WITH the vanilla if you like. Have you ever baked these on a stone? (pampered chef?) If so, do you alter the cooking time? I’ve never tried a stone, Katie, so I have no idea! But if the stone comes with instructions, I’d say do whatever they say for cookies. Often, too, I don’t even time when my cookies are in the oven, I just look until they are done. The edges are golden brown and the surface starts to turn golden brown, then I take them out. 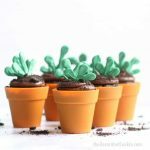 Has anyone ever tried using cake flour? I am very interested in the texture it would provide. I am so disappointed with this cookie recipe. I thought surely, after reading all the glowing reviews, that I had finally found a great-tasting recipe that didn’t get all sticky in two seconds. I did everything EXACTLY the way the recipe said, even refrigerating the dough overnight, kneading it gently before rolling between parchment paper. Still, within 5 minutes, the dough was soft and stuck to the paper. It was so difficult to peel away the dough surrounding the cookies that I had to just scrape the whole batch away with a spatula and put it back in the refrigerator to start over in an hour. What am I doing wrong? I was able to get a few cookies out of it but just as much trouble as any other recipe I’ve used. Soooooo disappointing. Hi Lisa, I’ll email you the same info, too, just in case you don’t check back. I’m so sorry you had trouble with this recipe! Yikes, I’ve never had that happen to me at all, so I’m afraid I don’t have a good answer. I’ve made this recipe thousands of times and not once has it failed me. There’s no way the dough should have been that soft to start even. If you left it in the fridge overnight, it should have been very hard in the AM, so hard that you’d have to leave it at room temperature until it was pliable enough to knead, and it sounds like it was still soft even after spending the night in the fridge. Also, I roll out chilled dough on a floured surface, not between parchment paper, which could stick. But back to the too-soft from the start thing. Did you substitute margarine? Or was your butter too soft or melted? Did you add only one egg and the full 2 1/2 cups of all-purpose flour? You should then only have to chill about 2 hours before using. Such a mystery, I’ve never heard of this result. So so sorry for your inconvenience! Thank you so much for this recipe!!!! 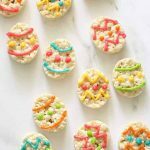 I’ve been looking for years to find a recipe that reminded me of cookies I used to make with my aunt when I was a little girl. The dough tastes exactly the same ( cause obviously you have to taste the dough before baking) :D. THANK YOU THANK YOU THANK YOU!!!!!!!! Oh my gosh, that’s fantastic, Kristen, thank YOU! Question. I’ve run out of plain flour but have self raising flour, if I remove the salt will this still work? Or should I just go to the supermarket. I warily say it shoooould be OK. I think the bigger issue would be a leavening, but since this recipe doesn’t have baking soda or powder, it should be OK even with the salt. The cookies might just be a bit puffier. However, I’ve never tried to bake them with self-rising flour, so that’s my disclaimer :). Just a non-tested theory! I reached cookie recipes for a long time. This is really the perfect cookie. I outlined and flooded with royal icing. They are amazing. Friends can’t stop eating them. The dough is easy to work with. Scraps can easily be reworked. Not a bit of wasted dough. My only question is this. How long can a frosted cookie be kept and maintain its original texture. What type of storage do you recommend. In the past I have found that plastic storage containers make a cookie get soft. I have my current batch in a tin but have no idea how long they will keep on the shelve. Is freezing this cookie frosted a good idea? Will it taste as great and look as great once thawed? Hi Richard, Yay, that’s great about your success with the cookies! Usually, when I make them they are for a party or event, or to giveaway, so I wrap them in cellophane bags tied with ribbon, and they last well, several days at least this way. Though I know the bags and ribbon are a bit wasteful for every day use. They freeze super-duper well. Very well. Often I freeze when I need to make a lot for an occasion. To freeze a decorated cookie, let them dry well (overnight at least). Then, place them in single layers in a Freezer-safe Ziploc, the gallon size. And stack in a box. Freeze. To thaw, remove from the freezer and let them come to room temperature IN THE BAG! Don’t unzip before they are thawed or moisture will get in and blur the icing. 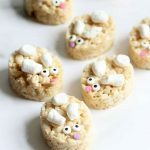 I have used this recipe about 12 times now and it is the most delicious, most forgiving, and easiest recipe for cut out cookies. I always, ALWAYS get compliments on the look and the flavor. I do almost NO baking except for Christmas cookies and this recipe is nearly foolproof! Thanks! That’s fantastic Krystie!! I’m so so glad that it works as well for as as for me. Phew. Thank you thank you!! I made these the other night and they turned out great! If you like a soft, delicate sugar cookie, this is the recipe for you! wonderfully delicious cookies! But the royal icing makes enough for about 10 batches! It does make a lot, Janet, but it lasts for so long and I find it irksome to make, so I always make the full batch! Then store it in Tupperware for the next cookie decorating session :). Yikes Crystal, I’ve never had any of those things happen, so I’m not sure what may have gone wrong?? Did you use butter that was softened but not melted? And mix in the powdered sugar well? Add one egg, beating well after the addition. Perhaps you used too much flour? Chilling overnight shouldn’t be the issue, as I’ve left dough in the fridge for several days. It doesn’t take long to get pliable. But this is a super easy dough to work with and it cooks very well every time, so I’m guessing the problem was either in your wet ingredients (the butter or egg mixing) or too much dry (flour). Actually… Crystal, now that I’m mulling it over, did you remember to put the egg in? If you forgot the egg, all of the above sounds about right. I’ve seen other recipes very similar, almost exact but they add baking powder. Why is that? I am making cookies for a baby shower and would like a recipe that does not spread. 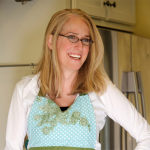 Hi Heidi, Baking powder is a leavening agent, so it’s added to help cookies rise, and it reacts chemically to help make cookies lighter and softer. However, I prefer a denser cookie and a sturdier cookie, especially when making cookie pops! I’ve had great success with my recipe and it almost never ever spreads. Make sure the butter isn’t too soft when mixing. And definitely chill the dough for a couple hours before rolling out. Hope this helps! Hi, I am from the UK, I haven’t tried this recipe yet. As far as the measurement conversions go, I’m assuming when you say one cup is equal to 8oz, that’s 8 fluid ounces? It’s just the one cup of butter and one cup of confectioners sugar are stated as different gram measurements, but both are one cup… Help! Hi Cherrelle! Yep, that’s what’s so frustrating about the US not getting on the metric board, the conversions are tricky. It isn’t a straight ounce to gram conversion because of the different densities of ingredients. One cup is a container measure here, so it’s essential what fills a certain size container (a cup). Butter is much heavier than the sugar. 1 cup of butter here, which is 8 ounces, is the equivalent of 226 grams (according to the butter package). But one cup of icing sugar is about 125 grams of confectioner’s sugar. I really need a sabbatical overseas now, I think :). woohoo!! Fist pumping myself. Thank you! So glad to hear!! I’ve also made them with vegan “buttery sticks” and egg substitute and they turned out well, so there seems to be a bit of forgiveness in the recipe. Thank you for checking in!!! 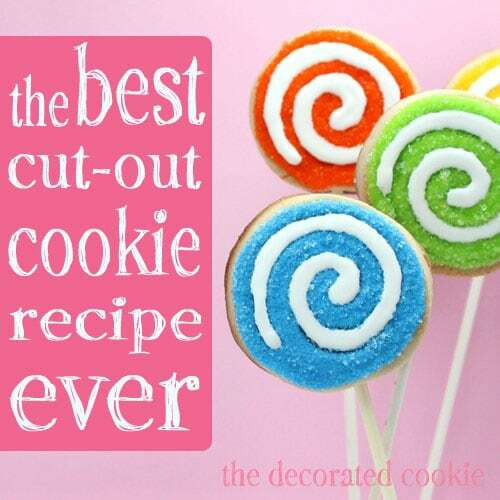 I was browsing the net, and came across your sugar cookie cut out recipe. This sounds like exactly what I am looking for. So my question is this. 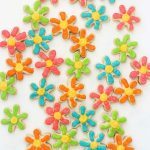 I want to make about 75 cookies for my daughters 1st BDay. Alice in Wonderland is the theme, so I was thinking of a simple heart cut out, and writing EAT ME on them. 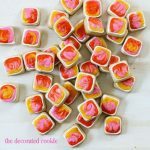 What would you recommend as far as how to decorate, and baking in bulk? Just wanted to give you a BIG thank you for this recipe! I’ve had a huge problem with my sugar cookies spreading and this left me with PERFECTLY shaped cookies. Yay! That’s fantastic Jessica! I don’t know what the secret is… the one egg thing? The chilling? using confectioner’s sugar instead? I don’t know, but I’ve had great success with it, too. So glad it worked for you! I LOVE these cookies – they’re the best cutout recipe I’ve ever made. Can’t wait to do a double batch tonight. 🙂 I like to do a simple glaze on mine of powdered sugar and a little milk. Once it hardens, I pipe on a little buttercream and use some pretty sugar crystals to look like snow! Woohoooooo!!!! So so glad to hear Carrie! I’m making mine for the holidays right now. 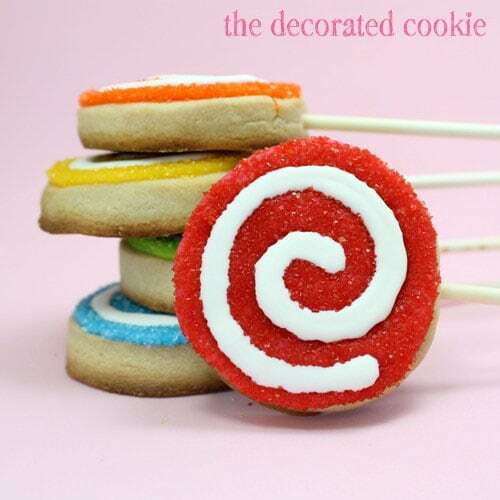 Love your decorating idea… yummy, quick and gorgeous! Hi – These sound great and are soooo cute! We are thinking about making these for a graduation party. 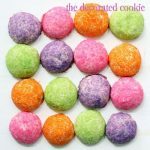 Have you ever baked and decorated them and then frozen them for a period of time? 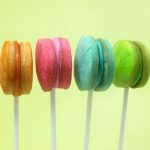 We want to be able to make these a few weeks ahead of the party but aren’t sure the best way to store them. Have you ever stored them in the freezer or refrigerator? Any thoughts on best way to keep them for that long? Hi Nicki! I’ve had great success freezing decorated cookies for several weeks! The instructions are in the post above. After decorating, let them dry well (overnight). Then, package them in one layer in freezer-ziplocs. Freeze. To thaw: Remove from the freezer and let sit at room temperature IN THE ZIPLOCKS! Don’t remove from the ziplocks until fully thawed. Chilled over night and now the dough is so crumbly it’s impossible to work with. Any troubleshooting tips? Hmm, is it possible you added too much flour? Also, did you let it rest at room temperature until pliable? If it has chilled overnight, you can’t use it right away. It will be too cold. Let it sit out for 30 minutes and check it. And if needed, another 15 to 20 minutes.